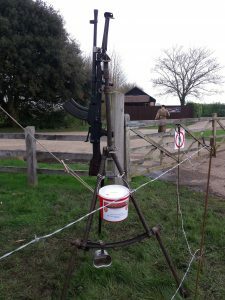 The weekend 14-15th April the group “Field of Fire” headed by Phil Terry, whose late father was a Normandy Veteran and member of the Southend branch NVA, attended Cressing Temple Barns near Braintree for the Internstional Living History Festival. 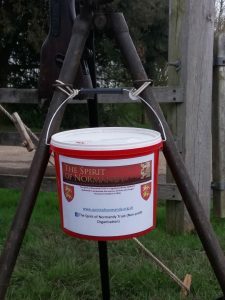 The photos show their display and a collection Bucket for the Spirit of Normandy Trust to which they give much support. 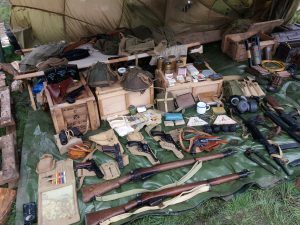 They will be attending Royal Gunpowder Mills at Waltham Abbey 5th – 7th May. 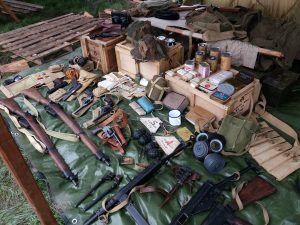 So will be collecting again. Our thanks to this group for all their efforts and consideration for the SONT.